Here's a response that @UNDSID to a post that was on Brad's blog. It's worth a read, it covers a few things that people are talking about. Those of us that commented on this in the beginning were told by UND Media Relations and others to be quiet and wait for “Big Announcements”. We knew that this would not be good for those outside of the MidCo area (ND,SD,MN), and we argued that fact. We were told that the streaming would be better, and it did not improve. HD will be great, but if it continuously buffers and dumps, what good is it. UND Media Relations said they would get the Flash Player issue worked out for those with Apple products, but that did not happen. Good luck using an App like Photon to play the feed. It looks like we are stuck with the garbage they are currently using and I am tired of people saying, “be quiet and wait, there will be big news”. Media Relations needs to push hard at a minimum for the FTA feed to be allowed for home games from MidCo for those who had invested in that years ago. That will not effect their dollars to any significance and actually help those outside of the area. That is just one step to appease the growing issues that they will be seeing. Six games is nothing and a huge, huge loss for UND Hockey. I would hope we would at least see some comment from UND, Media Relations or on up, on this problem for their alums outside of ND,SD, and MN. No one affiliated with UND Athletics promised anyone “big announcements.” Simply not true. What we *have* been saying is that we will continue to seek improvements to our viewing options across ALL platforms. That has not changed and that will not change. The broadcast situation we have today may not be the broadcast situation we have by the time the puck drops opening night. Or a year from now. These things evolve, take time and require a little patience. Did we promise HD webcasts and enhanced webcast support? Yes, beginning with the upcoming season our home webcasts will be offered in high definition. In light of the shifting TV situation, we have allocated and committed the necessary resources to providing high quality web streams. At the end of the day, fans will still have the ability to watch literally every single home game. Every one of them. Plus four road games. Some of these will be on your television screen and yes, some will have to be on your computer screen. You also have the ability to send the HD webcast feed to your flatscreen TV with one cord and one press of a button. In the coming weeks, our website will offer a video tutorial on how to make that conversion for those who are unfamiliar with the process. In the meantime, we will continue to do everything within our power to bring more of our games back to national TV. Neither UND, nor the NCHC Commissioner, is ignoring our television situation. Quite the contrary, in fact. But please understand that it is a work in progress. Tonight on NBCSN at 7:00 p.m. (C.T.). TV Contract coming for the NCHC? Brian Gomez of the Colorado Springs Gazette has this little news nugget in his media blog today, sounds like a TV deal is coming soon for the NCHC. Also, it looks more and more like the NCHC is going to have it’s conference tourney in the Excel Energy Center. This is not the first time that I have heard this and former Colorado Gazette Colorado College beat writer Joe Paisley had posted this as well in one of his weekly Gazette chats. Brian Gomez, Gazette.com --- A TV contract for Colorado College’s new conference will be announced within the next three weeks, and the NBC Sports Network, formerly called Versus, as well as Fox Sports regional affiliates have emerged as legitimate competition for CBS Sports Network. National Collegiate Hockey Conference commissioner Jim Scherr (above) told CC play-by-play man Ken Landau of the timetable for the eight-team league that will begin in the 2013-14 season during Tigers coach Scott Owens’ radio show Tuesday on 103.9 FM RXP. A total of 75 games are being broadcast this season on Fox College Sports, Fox Sports North and Fox Sports stations in Colorado, Michigan and Wisconsin; NBC Sports Network has 16 games, including the Hockey East Tournament; and CBS Sports Network has 23 games. Here is the bit on the NCHC tourney. I think the NCHC getting the Xcel Energy Center makes perfect sense because there is no way that the new revamped WCHA is going to be able to fill the arena without UND, UMD and SCSU. TV for this weekend's games. Image via WikipediaHere is the information on this weekend's series between the Fighting Sioux and the Wisconsin Badgers. Only Friday's game against the Badgers will be on TV. MEDIA COVERAGE: All Fighting Sioux men's hockey games, home and away, can be heard on 96.1 FM (The Fox) and on stations across the Fighting Sioux Hockey Network. Veteran broadcaster Tim Hennessy is in his 31st season as the voice of the Fighting Sioux. He is joined during home games by color analyst Steve Olson. Friday night's game will be broadcast live on Fox Sports North Wisconsin and Fox College Sports Atlantic. (Fox Sports Wisconsin Direct TV 669) Saturday's game will not be available outside of Wisconsin. Video webcasts for each game can be purchased at www.uwbadgers.com. Free (delayed) video streaming of both games will also be available at 10 p.m. each night at Wisconsin Public TV. Here is the video from the SCSU press conference that was held earlier today. The press conference starts at about 26 minutes. St. Cloud, Minn. - St. 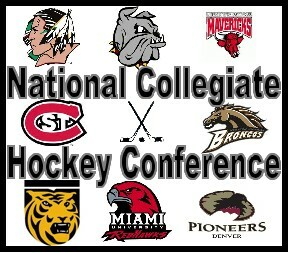 Cloud State University has accepted an invitation to join the National Collegiate Hockey Conference beginning with the 2013-14 season. The acceptance of this invitation for St. Cloud State’s hockey program was announced today by University President Dr. Earl H. Potter III. The Huskies along with Western Michigan University were extended invitations to join the The National on Sept. 21. The Huskies will join current league members Colorado College, University of Denver, Miami University, University of Minnesota Duluth, University of Nebraska-Omaha and the University of North Dakota when the league begins play in 2013-14.